My next exercise was working with another color combination from the color wheel that is called Analogous color. Using the Analogous rule will create a harmonious color scheme in a painting. 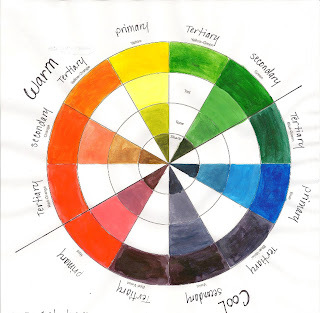 Analogous color schemes are made up of 3 or 4 colors on the color wheel that are next to each other or in a row. The painting below is a blend of Red, Red Orange, Orange, and Yellow. These colors have some white mixed into them, making them "tints" of the colors instead of full intensity hues. The Analogous colors blend and move well together instead of fighting with each other or intensifying each other like they did in my last exercise of Complimentary color. This painting is also considered a "Warm" painting. The color scheme is Analogous but also warm, meaning that they have a yellow undertone or base. A "Cool" color scheme would have blue undertones or bases to them such as blue, blue/green, green, and violet. Analogous paintings usually have either a warm or cool color scheme to them. Look at the color wheel and you will see that it is split in half between Warm and Cool colors.